Emotionally vulnerable and musically rich, Sir Sly’s long-awaited sophomore album Don’t You Worry, Honey has the look and feel of an instant classic. Released June 30, 2017 via Interscope Records, the achingly intimate followup to 2014’s powerful debut You Haunt Me finds the LA trio expanding their musical palette through a daringly diverse, yet surprisingly concise set of songs that stays faithful to, and builds upon Sir Sly’s unique blend of electronic, gospel, and hip-hop influence. But even in darkness’ deepest depths, Sir Sly strive to find a spark of light. Don’t You Worry, Honey ultimately tells an important story about the individual’s journey through grief and mourning, toward resolution. Just like their debut, Sir Sly’s sophomore effort succeeds at injecting substance and humanity into spellbinding music: Out of pain, the band creates beauty. 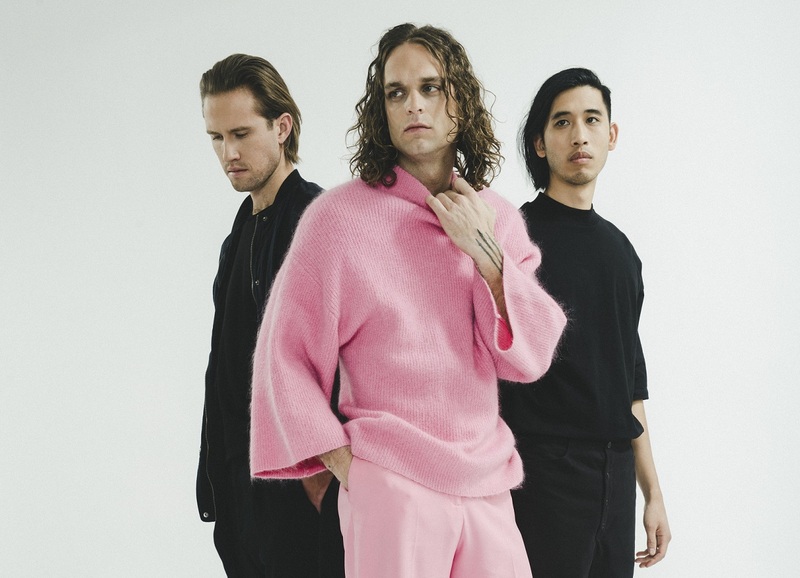 Join Atwood Magazine in diving headfirst into Don’t You Worry, Honey through our track-by-track review, and catch Sir Sly on tour this summer (dates below). In addition to preparing us for the story to come, “High” also bridges the sonic space between records 1 and 2. A torrent of guitar and pulsing bass lay a deep groove while Jacobs rap-sings the vocal line, a clear indication of the band’s direct embrace of hip-hop. Of course, “High” is only the introduction. While it has proven itself independently strong on radio charts, the song comes to mean so much more once you’ve experienced the full record. Did I run, did I run to the wrong side? Did I run to the wrong side? It’s as if, after going through the motions for so long, Jacobs has finally woken up to a history of regrets that he knows will haunt him for some time. All he can do is stumble through a deluge of memories until he finds his way back to the surface. “&Run” feels at once emotionally free, but also stifled: Jacobs sings of kicking his shoes off and running, an image that certainly evokes the perception of freedom. Yet his demeanor is so obviously weighed down by the past, that despite his best attempts, he cannot outrun or escape the burden of memory. am I mistaken for the way I carry on? We come to learn, quite quickly, that Jacobs is kidding himself. The cruelest irony of all, however, is that he’s well aware of this deception: He’s just trying to get out, by any means possible – and who can blame him? The profound poetry of the chorus’ line, “I’m counting all the numbers between zero and one,” reminds us that he is awake, alert, and conscious to his own missteps. “&Run” is bold and invariably genre-defiant, employing a little bit of everything in such a catchy way that everyone can join Jacobs in his melancholic introspection by the time Sir Sly hit that final chorus. Heart and soul collide in the song’s finale as, atop a background of gospel singers chanting glory, Jacobs prides himself on being fine – “I’m alive, I won’t worship at your shrine again,” he asserts, “And no, I do not want to be your friend.” It’s a shaky resolution, but it’s meant to be that way: If you were looking for decisive, conclusive emotions, you picked the wrong record. Sir Sly pride themselves on making music that is important – both to them, and hopefully to others – and “Altar” is a prime example of that methodology at work, leaving us with a pit in the bottom of our chests. “Fun” has a surprisingly similar drum pattern to “You Haunt Me.” It also has a surprisingly similar melodic pattern, leading one to believe that the band may have felt things were left unfinished with their debut’s album track. Whether or not these two songs are related, “Fun” offers a particularly engaging reprieve from the surrounding darkness in its attempt to continue a positive, cheerful life. Just as we think it might be time to reconcile feelings, Sir Sly refuse confrontation. “Astronaut” is untethered, a beautiful electronic tune that soars on denial’s delicate wings. Jacobs expresses a preference to stay above it all, but “feeling like an astronaut in space” means you’re floating in an ether, feeling nothing. Is it better to be numb? To answer this, we might harken back to You Haunt Me – which certainly dealt with that theme quite a bit. Though it covers a theme, Don’t You Worry, Honey isn’t meant to be a concept album, and it is prudent to understand each song like one might a flashback in time – each track captures a piece of the pie, but there is no set timeline. Regardless, “Astronaut” maintains an infectious bounce that holds steady before the drop. Darkness ultimately falls, and it drags heavier than anyone could have expected on “2am.” Jacobs’ croons are tasteful and dynamic as he dives into his own head, reeling from the terrors that keep one from succumbing to sleep. We feel this pain quite vividly; dark synths cut through the airwaves, enveloping our ears in shadowy, ominous sound as Jacobs takes us, thought-by-thought, through a bona fide panic attack. Tension grows slowly, intensifying as Sir Sly draw it out, refusing to build to a release and instead keeping listeners in their own tense state. Another profound blend of hip-hop and ‘electronic indie-pop’, “Trippin'” hooks us through a compelling falsetto and the timeless story of misplaced romance. A tale as old as time plays out as Jacobs knowingly engages when he ought to disengage; thirst outweighs control and results in a toxic mix. The closest thing to a traditional “love song” on Don’t You Worry, Honey turns out to be more of a metaphor, than a direct indulgence as the band slip tenderly toward their album’s end. Hesitation, uncertainty and sadness fill Jacobs’ psyche as he struggles to move on, again questioning his readiness to get back into the real world. Has he picked up the pieces? Can he really move on, or will he end up back on the floor, or worse – in the clouds? How can he know when the time is right; how can he properly prepare himself? He has nothing and no one to fall back on; his experiences thus far have been wrought with complications, thus giving him little hope to believe himself mentally stable enough to return to the life as it was once known. There is no medicine to grief. It will flow like a river, engulfing you in waves of strife until you drown from within. Thus, Jacobs finally opens the floodgates: Here, we are told the heartwrenching story that has been dragging his entire being, wearing and tearing at his soul these past few years. Will I just go numb again? And do something dumb again? Like cheat on my best friend? It’s not much, but it’s a start – and it’s beautiful. Sir Sly conclude their sophomore album with a heartbreaking tribute to Landon Jacobs’ mother. Singing directly to her, Jacobs fills the airwaves with sadness. He misses her dearly, and he tells her that, recalling the funeral and his own blockage of emotions. Could you stay a moment? Something beautiful starts to happen in the chorus. “One day I’m going to sing with you again, oh mama,” Jacobs passionately cries out to the heavens, a sleek and winding melody lending the surrounding soundscape a particularly soulful atmosphere. This is his story’s swan song, the ending it’s been searching for since its start. A glimmer of resolve appears from within. Startlingly, this is not a one-way conversation. The song’s breakdown features an appearance from Jacobs’ mother by way of voicemail; she sounds bright and chipper as she returns a missed call, checking in to tell her son she misses him, hoping all is well and assuring him that she’s fine. The inclusion of such a personal memento only deepens Don’t You Worry, Honey‘s personal significance, highlighting as well the permanence of death’s disconnect. Yet “Oh Mama” is not tense, like some of the other songs on this record. Rather, it feels free; amidst the backdrop of choral singers, the song’s passionate melody soars. Jacobs bids a temporary and heartfelt farewell to his mother, promising himself and her that they will be reunited soon enough. Though the weight on his shoulders hasn’t lifted, we feel a shift in the singer’s tone: His grief is transforming into something more substantive. A hauntingly sweet, half-whispered final verse brings “Oh Mama” and Sir Sly’s second album to a breathtaking close. The veil of darkness finally feels like it’s been lifted, and a little light is beginning to shine through. Such is the magic of music, that we might feel solace and relief from our trials and tribulations. A fitting end to an often impregnably dark album, “Oh Mama” may not be the most reassuring message, but it is the message Sir Sly were searching for – the one that could offer closure to one of the most trying times in a young artist’s life. Finally, we can understand the greater meaning in album opener “High”: It feels good for the first time in a long time now. Hayden Coplen, Jason Suwito, and Landon Jacobs have done it again: Three long years after their debut album, Don’t You Worry, Honey is a fitting follow-up full of human emotion, moving music, and innumerable life lessons.